Escape to your quiet place in our private area designed exclusively for select hotel guests. Bask in the stunning city skyline as you enjoy a light breakfast at sunrise or start the night off right with complimentary hors d'oeuvres. Let us cater to your every whim. From 6am to 9pm daily, enjoy complimentary food, non-alcoholic beverages, and access to a 60-inch HDTV on the Concierge Level. 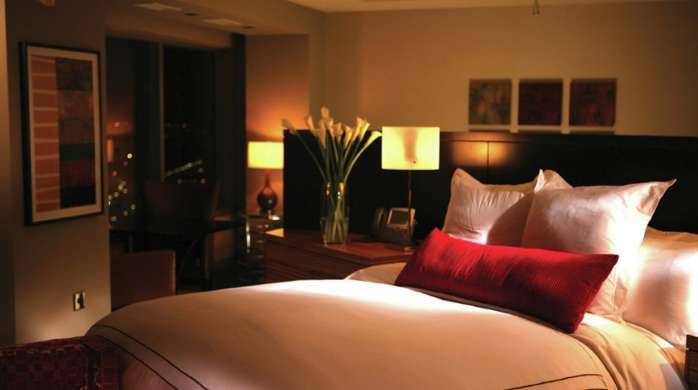 Indulge in our Concierge Level Luxury guest rooms and surround yourself with the world’s finest amenities. Guest rooms come complete with a oversized marble shower with dual rain heads, climate controls, and daily housekeeping and in-room dining for your convenience. Our full-service concierge staff is prepared for your arrival and at your service to assist with restaurant reservations and any special arrangements needed during your stay. *Concierge desk is located inside of the Hotel Living Room. Enhance your spa or hotel visit with invigorating therapies at our state-of-the-art Fitness Center.